...and what a great color combination it is! Old Olive has always been one of my favorites (any green really! ), and you can never go wrong with some black and GOLD! I tried something a little different on my Simple Sunday post, which was to keep the layering to a minimum...I decided to try it again today, and I think I'm kind-of liking it! Not that I won't return to my layering ways because....well....I know me and I will. Sometimes it's refreshing to do things a little differently! I built this card on a Thick Whisper White cardstock card front. I used two different sizes of Layering Circles framelits to cut the Old Olive circle frame, and the leaf, cut from Gold Foil, is from the Seasonal Layers framelit set. The speckles are from the Timeless Textures stamp set and are stamped in Old Olive ink. I cut a thin strip of Basic Black cardstock and tore one edge to start the strip on the left side of the card. I glued the gold scallop, which was cut with the Decorative Ribbon Border punch, to the backside of the black cardstock. (While I'm on the subject of that scallop, I want to say that it took me FOREVER to figure out where it came from when I saw it on other projects....I'll save you all a lot of time and effort by pointing out that you can use either edge of the Decorative Ribbon Border punch and one side is that tiny scallop.) The strip was then adhered to the edge of the card and I wrapped the black and white twisted baker's twine around the card front and tied a bow on the front. The sentiment (from the Basket of Wishes stamp set) was stamped onto a strip of Old Olive cardstock using Basic Black ink. I added a few gold sequins from the Metallics Sequin Assortment to finish it up! 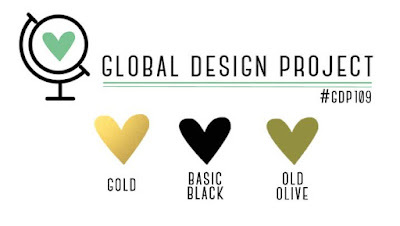 Be sure to check out all the beautiful ideas over at the Global Design Project this week!